The Collier section of the Panhandle Trail will begin resurfacing Monday, January 14, 2019, extending from the trailhead in Walker’s Mill to the Gregg Station entrance. Resurfacing will be expected to last a week, weather depending. The trail in sections of those four miles will be inaccessible or unusable during resurfacing, and equipment will be parked on the sides the trail. During resurfacing it will be best to avoid that section of the trail and enter at Gregg Station. Sorry for the inconvenience, but this will renew the trail surface AND repair and mitigate the damage from stormwater. Join us again when it’s done! Please note: parking at all trail entrances is in gravel lots. Public Works Yard. 110 Noblestown Road, Carnegie PA 15106. For a Gold Award project, Girl Scout Ashley Altieri placed 20 different plant podiums throughout Panhandle trail. Each post/podium displays a picture of a plant/wildflower that can be found on the trail, along with a passage of information that describes interesting facts, stories, or characteristics about it. If you are unable to locate all of the podiums, or you would like to see where they are, click the link below for a digital map of the trail that displays the general vicinity of each podium. There is also a link for a list of GPS coordinates if a person would like to hike with their GPS and find each of the posts in that manner. The posts can be found from the beginning of Panhandle Trail (by Walkers Mill Road) and end by Sunnyside Road. There isn’t anything but the Rennerdale Corner Store in the Collier section of the trail, which is what we manage. The Panhandle Trail doesn’t have one overall organization to manage a project like that. The larger maps come from the DEP. But maybe someday someone will undertake that map. Would love to see a map with local business to stop for ice cream, drinks, lunch/dinner, breweries easy access for bikers. The Washington County section is paved. This site only manages the 4-mile section in Collier from the trailhead to Gregg Station. Could you please tell me which section of the trail is paved. Jay. sorry for the late response. Most of the trail is as level as it was when it was a rail line, all of the Allegheny County stretch for certain. Some areas in Washington County had been repurposed and have a few hills, but even they aren’t too extensive. We only manage the Collier Township area at the trailhead, but the map above shows Burgettstown, and the trail seems to be right on the edge of the business park. The website for the Montour Trail sometimes has more detail for that area. Thanks for visiting. We are working on that for the Collier section of the trail along with a map of just the Collier section. It will be done by the end of this month, and will be posted here. For now you could use the address of the Rennerdale Corner Store which is at the corner of Sunnyside and Noblestown Road, just a few blocks away: 148 Noblestown Rd, Carnegie, PA 15106, and use Rinker Pipe for the Gregg Station crossing at 2000 Gregg Station Rd, Oakdale, PA 15071. Are there addresses that I can plug into my GPS for car parking at entry points along the trail? I’d like to vary my rides instead of always starting at the same point. Hi! Thanks for all the great info! I checked the trail out this morning. Do you know if with all the construction happening if more water fountains are going to get installed? Two that are both placed at the beginning of the trail is pretty rough on a hot day even with a camelback. Britney, yes, dogs are very welcome to share the trail and the woods, and they especially like to splash around in Robinson Run! All dogs must be on a leash for the safety of others using the trail including runners and bicyclists, and bring some bags for cleanup. I was wondering are dog aloud on the trail? It looks like Harmon Creek is the closest point to you. I know there is some development beyond that point but I couldn’t tell you how far along that was, so it looks like your best bet is to head for Harmon Creek and start there. Alternately, I also know many people start and end at Burgettstown. It’s a bigger town and has many amenities. Enjoy your ride! Mike, when are you planning your trip? If you’re coming through the last weekend in August, make sure you stop in at Rock the Quarry at the Walker’s Mill Trailhead, August 28-29. 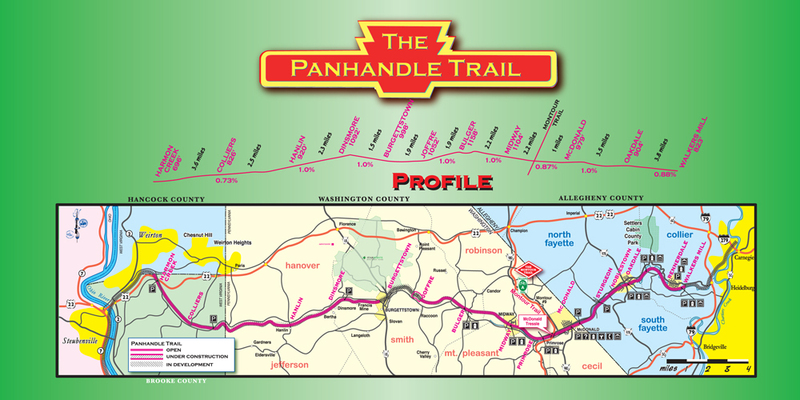 As far as amenities, this site only handles a portion of Panhandle, from the trailhead at Walker’s Mill to Gregg Station. But you could take a look at the map at the top, find the names of the towns where you think you might stop, and do an internet search. Alternately, you could visit the site for the Montour Trail which crosses Panhandle and trail users often use both trails–I do. Their maps page under “Plan a visit” (http://www.montourtrail.org/map/maps.asp) has amenities for the Montour Trail which you might be interested in when you get to that area, and you could also ask in their Facebook group or email them to see if they have any information. I am planning to ride bike from Akron, Oh. What would be the easiest way to find B&B or hotel accessible from the trail?